The Problem: You have two email accounts. One is configured in Outlook and auto-forwarding enabled on the other, forwarding account to the personal one. You want to add the second account to Outlook, but just as an address to send messages from. Note: If you are using Outlook 2010 with an IMAP account set as default and one or more POP3 accounts in your profile, this method is not necessary when Outlook 2010 SP1 or greater is installed. Mailto's will correctly use the default account. See Multiple Accounts and the Default Account for details. The solution: Create a "send only" account in Outlook. To do this, you need to add the account as a POP3 account and use a fake Incoming server name. In the Account Settings dialog, click Add. Configure authentication for the outgoing server, then close the dialog. 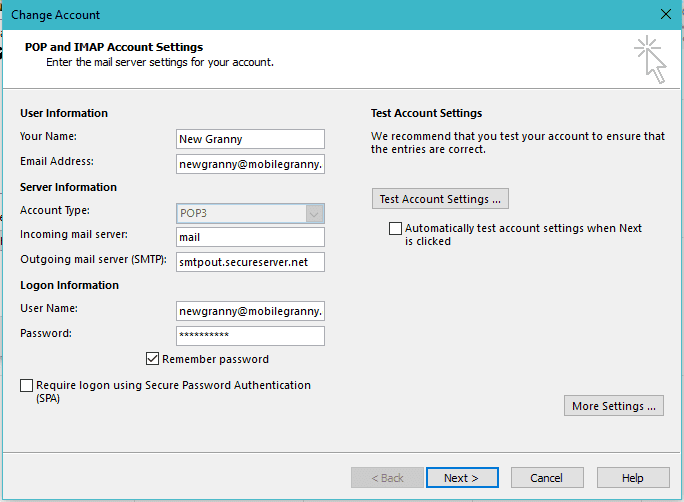 Uncheck Test account settings before clicking Next to complete the dialog since the fake POP3 server name will fail. Back in Outlook, open the Send and Receive dialog by pressing Ctrl+Alt+S on your keyboard then select the All Accounts send and receive group. Click Edit. Select the account and remove the check from Receive Mail Items. Close the dialog and return to Outlook. When you check for mail, this account will be skipped. When you select this account while composing a message, it will be sent according to your setting (either immediately or on the next mail pass). To create an email account to download mail and send all mail using a different account, see Choose the account to send a reply from. This no longer works since Outlook changed the account creation process. It now requires you to log in to the POP server. Do you know of any workaround? Since this change happened, I use the Mail Control Panel (Office16\MLCFG32.CPL) Email Accounts... instead, where it works the 'old' way as Diane describes above. You may want to update this procedure slightly: With Outlook v1706 build 8229.2086 I can no longer use a 'fake' POP server because there is no longer an option to *not* test the account when you create it. The work around I arrived at was to use a genuine POP server at the account creation time, and then modify the account afterwards to change to a fake POP server. What a complete pain! I hate that new dialog. :( they are also blocking the ability to add an address twice. My email stopped receiving messages. I believe it is Outlook 2013. Any suggestions? What type of email account do you use? Any error messages? Can you send email? An excellent description. It was great that it worked, especially for a send only account, being worked via an alias address! When it all worked I was able to let out one of those explosive "Yes!!" - two days of pent up frustration released!. At this time, Microsoft doesn't allow the 3rd party addresses to be used as the From address when sending from Outlook. The only way to send using that email address is to configure the account in Outlook. Of course, when you do this, the mail is not stored in the outlook.com folder because an EAS account can't upload mail. 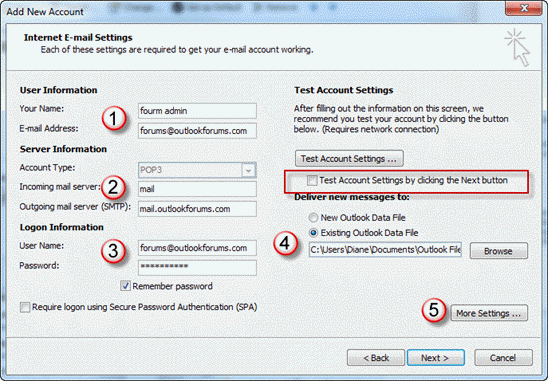 You can configure the account in Outlook as an imap account. Use IMAP to the outlook.com server for incoming and the account's SMTP server for outgoing. Mail will be stored in the imap sent folder and uploaded. I have created a prf file that create an exchange account and a pop3 send only account. this prf import every time a user opens outlook 2010 on RDS 2008 R2. i did not figured how to remove the check from "Receive Mail Items" globaly by command ,gpo or registry. i think that because the pop3 account try to send mail when outlook start the users gets outlook "not responding" for a few seconed until it released. please suggest me how to solve my problem. This setting is not set via GPO because each profile can be different. It's also not set via PRF. It doesn't look like it's stored in the registry, which means its in a hidden file in the mailbox or pst. You can double check my findings using a utility called RegShot. Scan your registry with it, then make the change and scan again. Look through the compare results. Diane--I love your site. I'm hoping you can clear something up for me. In earlier version of Outlook I created "send only" POP3 accounts that did not create a new data file. Thus, the "account" did not show up in the folder pane, but the account was listed as a "From" option and the sent items just went to the default sent items folder. Is this no longer possible in 2013? I create a new POP3 account but it seems to require a new data file. I want to simply have my outlook.com EAS files in the folder pain and nothing else (as before). Any ideas? EAS accounts can't upload mail, so you can't select the EAS data file as the deliver to location. If the main account was POP3 or IMAP you could use it's data file for the (non-existent) incoming mail and sent items.